Not only did the homeowner choose a seizure-inducing shade of yellow for his base, but he decided to accent the hideousness with BOLD! BLUE! To add insult to injury, he added a "Lego Block" trim to all the windows and doors. While these colors are great choices for a company logo, they don't translate particularly well to house paint colors. I was, for a short time, hopeful that maybe the guy was experimenting with drugs and that when he came down from his trip he might see the error of his ways and go back to nice, plain white. No such luck. Not only did he complete the paint job, he left it up. I find this permanent memorial to bad design unsettling. I feel particularly awful for the owners of the house next door, who just recently renovated their home and finished it out with new landscaping and tasteful gray siding. I've never wished for an HOA more than when I saw this poor house being slaughtered by poor paint choice. Technically, this home is in a different neighborhood that borders ours...but it still offends my eyes when I drive by. I'm shocked there haven't been any accidents yet from rubbernecking. Are there any eyesores in your neighborhood? We have one that same color in our neighborhood, however the trim is forest green instead of blue, the added bonus is its a two story so it is even bigger! I use it when giving directions to our house "if you've made it to the yellow house, turn around because you've gone too far!" Thankfully I live in a rural neighborhood and while the houses may be old, they don't look like they're made of Legos! However, this reminds me of a OLD neighbor who worked for the highway dept. 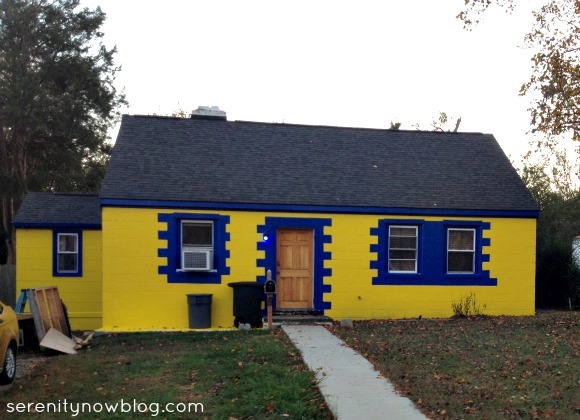 He took paint from work, the same bright yellow that runs down the middle of the road, and painted his house with it. It was horrid. WOW thats a powerful color, my first thought was LEGO HOUSE! ha! I hope the people who painted it aren't planning on selling it anytime soon! Those colors are not very seller friendly:) We don't have any bold colors like that around here, but there are quite a few interesting houses! When I clicked on the link in my FB stream, I was assuming this was the BEFORE photo. Lord have mercy! Nothing too offensive right near us. The house across the way was looking a little down-troddin' because a single woman working too hard lived there. Sadly, she got foreclosed on. An investor bought the property, and is 'flipping' it. It's been fun to watch, and it's coming out beautiful. I have to heartily agree with you!! It is obscene!!! I'm all for creative expression, even if I don't like it. LMAO! Our house was the eyesore when we bought it. It was literally this same shade of yellow! Now it's a soft green. In our last neighborhood we had a house that was the most awful shade of PINK!! I would say that having no HOA, and the problems that come with its absence, was one of the main reasons we moved. I'm so sorry you have to look at that eyesore! My advice, invest in blinders for the drive by!! Oh man...SO sorry! I drove by a house recently and WISHED I would have taken a picture. It was a box of crayons. It made me think the homeowners were of a different cultural background because we've had family live/visit Hong Kong, Taiwan, etc. where home design is VERY different! I feel for you Amanda - but I guess that's the price we pay for living in a free country! LOL! Amanda, we have an eyesore at the end of our block. It's just awful in a lot of ways. . . but I must say that it makes a great landmark! People always find it easy to locate our street when I tell them to turn by this ridiculous house. Years ago we lived in a neighborhood with a very active HOA and stringently enforced code. It was a pain in some ways, but it did ensure that everything always looked nice. That is awful! I do really feel bad for the next door neighbors. Oh good grief...what was he thinking? We don't have anything like this in our neighbourhood, but my in-laws live across the street from a man that has everything on his home pink...yes PINK! Even an old trailer in his drive and the ghastly old vehicle that sits on the street. That really is an eye-sore. I can't believe someone would choose those colors, Blah! Do you see the yellow car in the driveway? It blends right in, must be a favorite color! It's for this very reason that I chose a neighborhood with a HOA, so I don't have to live next door to a house like that. Haha! That is hideous! There's a house in our city, not near us, thankfully, that I call the Big Bird House. It's Big Bird yellow with Oscar the Grouch colored trim.